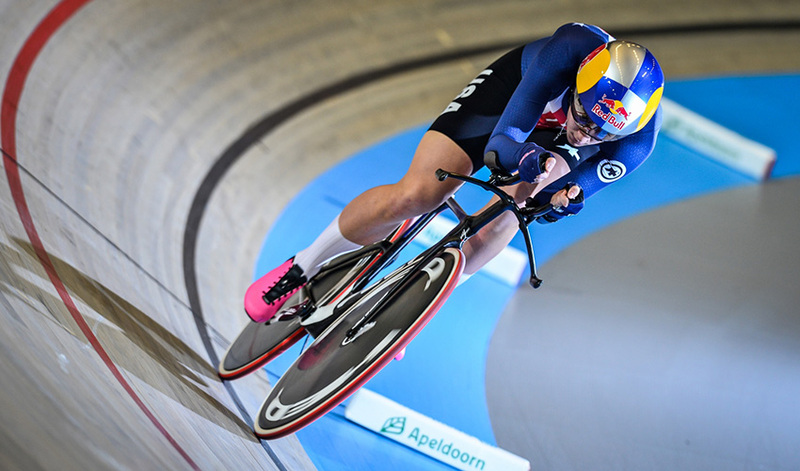 Chloe Dygert Owen's time of three minutes 20.072 seconds in individual pursuit qualifying at the 2018 UCI Track World Championships in Apeldoorn not only broke but smashed the existing world record by two seconds, before she lowered it again in the final to 3mins 20.060secs. The former record of set by friend and former teammate Sarah Hammer in Aguascalientes at altitude of 3:22.269 had sat untroubled since 2010, until the 21-year-old came within a second of breaking it at the 2017 Worlds in Hong Kong. Having had the record within her grasp a year prior there was to be no denying Dygert Owen this time with the American star more determined than ever. After breaking the record in qualifying track cycling fans were left wondering what she would do in the final and Dygert Owen didn't disappoint breaking it for the second time in a matter of hours. Making the time even more impressive was the fact it was done at sea level and was faster than many teams rode in the 3km team pursuit. Not to mention just her third individual pursuit in competition. While the time impressed everyone having been eyeing a 3:18 Dygert Owen left Apeldoorn with mixed feelings - two world titles taking in her suitcase taking her number to seven but determined to hit that 3:18. 3:18 may be the short term goal but her ambitions do not stop there with her ultimate goal an almost unthinkable 3:10. Her focus to date has been on the timed events that have seen her claim five track world titles in three years, three in the team pursuit and two in the individual pursuit. Though Dygert Owen admits the omnium and Madison are events she would love to do, and it seems only a matter of time before that happens. A change in coach mid way through 2017 has only energised her further with long time Australian coach Gary Sutton joining the US programme with immediate success. The pair have quickly forged an effective relationship with Dygert Owen giving her World Champions watch to Sutton. With track season finished Dygert Owen returns to the road with Twenty20 p/b Sho-Air and having narrowly missed a medal in the time trial at the 2017 Road World Championships in Bergen, gold in September in Austria is her focus now. Looking to add the elite title to her 2015 junior crown, where she first announced herself to the world. The last two years have seen some of the most exciting individual pursuit racing with Dygert Owen now breaking the long standing women's world record and the men's equally as exciting something she hopes may lead the event to return to the Olympic programme in the future. Had a training camp in Mallorca ahead of Worlds how important was this for your preparation? I struggle adapting to time change so having this camp beforehand made the transition into Worlds a lot easier - All I had to worry about was making sure I had fresh legs! Worlds started off well for you winning a third team pursuit world title in a row. You pulled some huge turns that really gave the US the edge over Great Britain how did the rides go for you? Did you take some confidence from them in to the IP? They were hard, but that's how it's supposed to be. I was confident in my training, I knew that no matter how much the TP took out of me that I still had a good shot of winning the IP. Broke the IP World Record by over two seconds in qualifying 3:20.072 how did it feel looking up at the scoreboard and seeing the time? Were you happy with it? I lined up to get a 3:18 so seeing 3:20 on the board was upsetting. My all-time goal has changed a few times but before I retire I want to break 3:10, I won't be happy with any performance until that happens. You were struggling to stand after the IP. For the person at home what were you feeling as you stepped off the bike? How much does a ride like that take out of you? I have been struggling with hip and back problems for the past two years, the high cadence and standing starts really hurt me. You will see my physical therapist there to walk me back to the massage table to quickly relive the pain that developed from the ride. With three team pursuits and the fastest ever individual pursuit in your legs how did you find backing up in the final to lower your world record even further? That was something I wanted to improve on personally. If you look back at Hong Kong, my qualifying to finals IP was two seconds slower. The training I had done beforehand sharpened me up, so I wouldn't drop time in the final. At the end of 2016 when asked about the individual pursuit and looking to break the world record you said "For sure! Sarah holds the world record in the IP and I do hope to someday break it." Less than 18 months on and having raced the IP just three times you broke it by two seconds did you expect to do it so quickly? At the time, I didn't know what it took at that time to run a time like that. After almost breaking it in Hong Kong I knew the next time I did it I would break it. I expect myself to do whatever I set my mind to, no matter the timeline. Has been two weeks since breaking the record have you had time to reflect on your rides? What does it mean to you? There is a lot of work that needs to be done. I am happy to see how much room for improvement there is. You have a new track coach this season in Gary Sutton and you gave him your Tissot World Champions watch from the IP how have you found working with him? Forged a close relationship very quickly? Good Ole Gar Bear. He is great, enjoying him as a coach. Expect to accomplish great things in the future with him. With two world titles and now the world record is the IP something you are going to continue to work on trying to go even faster? Like I mentioned, I want to break 3:10. I will ride the rest of my career if I have too. I will do it! So far you have just competed in the team and individual pursuit on the track is the omnium and Madison something you are looking at in the future? I would love to do both; we will see how the next two years go before for the games. Your friend, teammate and mentor Sarah Hammer retired at the end of last season what was Worlds like without her? I missed having Sarah there, it will never be the same without her. I am just so thankful for FaceTime; we talked in between my rides. She gave me my extra .012 seconds for the final. The IP was only included in one World Cup last season and with few other opportunities to race it after some of the most exciting racing and times the last two seasons do you hope what you have done sparks a resurgence in the event? I hope so, I would love for it to be brought back into the Olympics. Just over two years now until the Tokyo Olympic Games and while the IP is not on the programme the TP is how do you feel the US is travelling as you look to improve on silver for the US at the last two Olympics? We have so much to improve on, so many new talents to find - BUT - We will be ready to fight for gold in Tokyo.